Brenda has spent the last 14 years in tourism and has served on Aboriginal Tourism Advisory Boards for the Minister of Tourism Parks and Recreation in 2008 as well as for Travel Alberta in 2006. 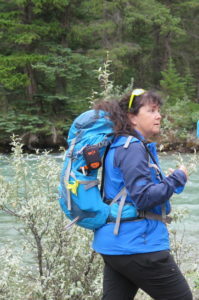 In addition, Brenda has been engaged in Aboriginal Tourism since 1998 and was an active member of Niitsitappi (before being taken over by Travel Alberta). Restructured and ran the Métis interpretive centre at the Canadian National Parks Rocky Mountain House 2006. Trained guides and consulted for the Métis heritage site “Métis Crossing” for the six years. Worked closely with Jasper National Parks introducing culturally based programs, which is at present an ongoing project. Recipient of several prestigious awards for her work in using her company both in the entrepreneurial spirit and in educating the public about Métis culture. One of these awards was the Aboriginal Woman Entrepreneur Award of Distinction presented from the Alberta Chamber of Commerce. Took part in several film documentaries and one television series: Mahikan Trails was presented on Profiles of Success on Aboriginal People’s Television Network. Tomiuk Productions filmed Mahikan Trails in a documentary/training video to be used in a Lakeland College training course for Adventure Tourism. Mahikan Trails was showcased as one of the Adventure Partners in the Aboriginal Tourism Sector. In 2006 Brenda was filmed in a TV series called Fish Out of Water, featuring Métis heritage, culture and skills. In 2010 Brenda hosted her own TV show called “The Hookup” again featuring her heritage and culture. The show took home the prestigious “Rosie” award in Alberta.